Totally not a failure point. I saw those, and what a wonderful idea, a heavy tire with the ability to zip another, heavier tire, over. The only thing that could make it better would be if the tire mounted on the rim was solid, virtually eliminating flats. 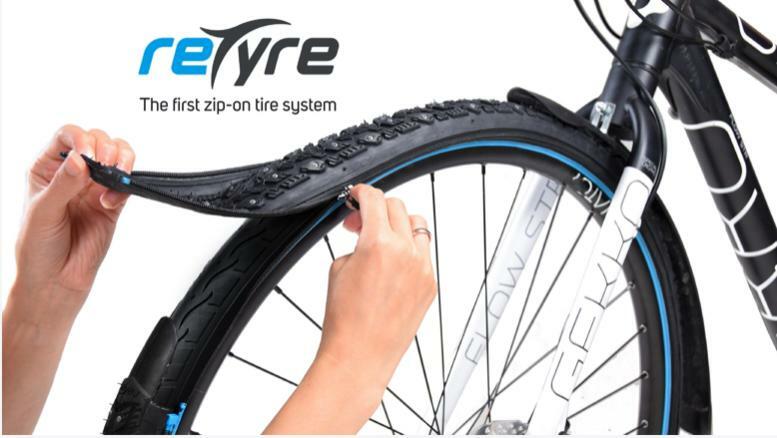 And just think, if a tire wore out in the middle of a ride, it would just be a matter of unzipping the outer, wore out tire, throwing it to the side of the road, and continuing your ride. What is the weight of the tire? What is the weight of the skins? Roughly 5lbs of tires. Yikes. Check the FAQ they're selling only 1.6"-2.25" width tires in 26", 27.5" and 29"...and 550-600grams isn't that bad for such a wide tire. Particularly for something that isn't supple/thin and puncture prone. No, not bad for a MTB tire. But you essentially have 4 MTB tires. Correct me if I am wrong but wouldn't it be a bit better peace of mind if the zip to close direction were opposite of what is shown in the picture (as well as the video at kickstarter)? You can mount yours the other way, I'm going with what they said! Nothing like adding another layer of slop into the crisp turning ability of a 26"er. In general for most situations I agree that these are a problem prone solution looking for a problem. But for a commuter riding in cities which can see occasional accumulating ice on the paths, being able to switch between studded and slick tires quickly would be a nice option to have. Other usage cases, not so much. Hmmmm, if I wanted street vs snow tires, I would just get another set of wheels. It would probably be A LOT easier than unzipping and zipping my tires on, especially after I rode through a pile of dog? horse? shiet. You're overthinking a bad idea. I'm still upset with myself for watching the video. Now that's a sig-worth quote. So, it's a Kickstarter? I'll donate 2 cents, because that's what this idea is worth. Jerseys with Hidden 3/4 Zippers - WHY?